You'll completely forget about Toe Jam and Earl not making it into Sega All-Stars Racing when you get your first glimpse of Shenmue star Ryo Hazuki astride his hog. 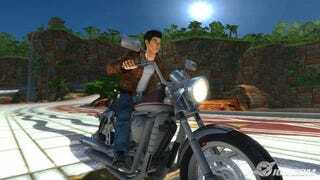 Who needs Shenmue 3 when you can get the total Shenmue experience playing as Ryo Hazuki in Sega All-Star Racing? Ryo puts the kitten-feeding and gashapon collecting to rest in order to make sure Sonic, Tails, and that damn monkey from Samba De Amigo don't prove themselves faster than his motorcycle. If that fails, Ryo can also get behind the wheel of a forklift to truly fork with the opposition. With the inclusion of Ryo as a Sega superstar, could Shenmue 3 be far behind? Probably.